Antelope Point Marina is the newest marina on Lake Powell and the only one which is not operated by ARAMARK. Rather, it is operated by Antelope Point Holdings which is the only other concessioner authorized by the National Park Service to operate on Lake Powell. 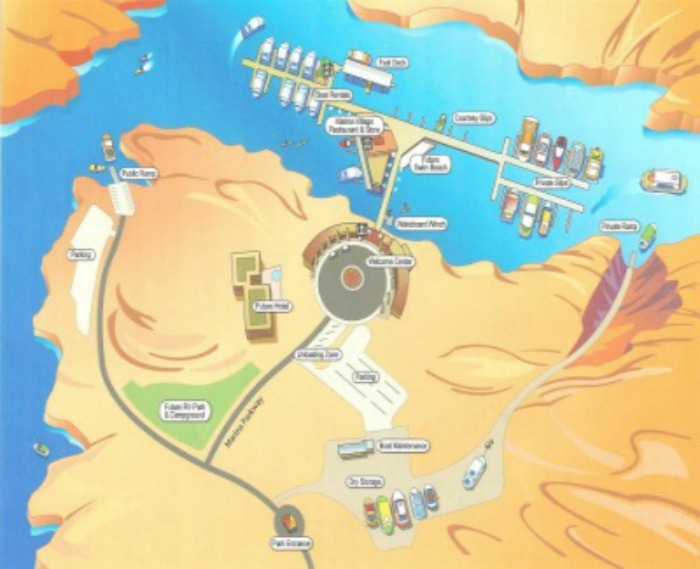 This marina is located approximately 5 miles from Glen Canyon Dam if you travel by water or about 8 miles by automobile from Page, Arizona off State Road 98. The main focus here is the Floating Village which sits on a floating platform composed of 33,333 cubic feet of concrete, 247,000 pounds of reinforcing steel and 122,000 cubic feet of Styrofoam and is considered the largest of its kind in the world. The 27,000 square foot Village consists of a 5,000 square foot store and full service restaurant, a snack bar, public restrooms and a bar and lounge. Their recently added water park is the only one on Lake Powell and now features two wakeboard winch towers. A water park is a body of water with cable towers spread around the water area. A wakeboard rope and handle is attached to the cable. The boarder holds on to the handle and is pulled around the park. Parks may have jumps spread throughout the water area as well as rails. Rails are simply raised railings which the boarder jumps onto using an Ollie (jumping without using the wake) and slides along its length. Depending on their levels of skill and courage they may do tricks along the rail and/or when dismounting.